It turns out that Brown spent most of 2011 living in the entryway of Bressick's two-story office building in Encino, an upper-middle-class part of the city. Bressick says he told Brown it was OK to stay there, as long as he was gone by 8:30 in the morning — when the office opened — and if he kept the place clean. Bressick says he did it because he'd been blessed in life, but "not everyone's so blessed. What's so wrong about letting a guy have a place to sleep?" He says he didn't even know Brown's name. "He always picked up," says Bressick. "We never got one complaint from a client." He was struck by how organized Brown was with his belongings, lining them up along one side of the alcove each night before packing up each morning. But one day last year, Brown just disappeared. Bressick didn't know where he'd gone but figured he'd just moved on. Then in December, an envelope arrived at the building addressed to "The Attention of the Property Owner." Inside was a holiday card with the following handwritten note: "I am the man who was encamping in the 'All State' alcove. I want to thank you for your tolerance in what was clearly the most challenging time of my life." It was signed with a heart and a peace symbol. Bressick was blown away. He wrote back and asked the man (he still didn't know his name) to get in touch, which he did. Bressick and the other owners of the building invited Brown to come back for a visit and to accept a $200 gift for the holidays. "We decided we'd like to help him out," says Bressick. 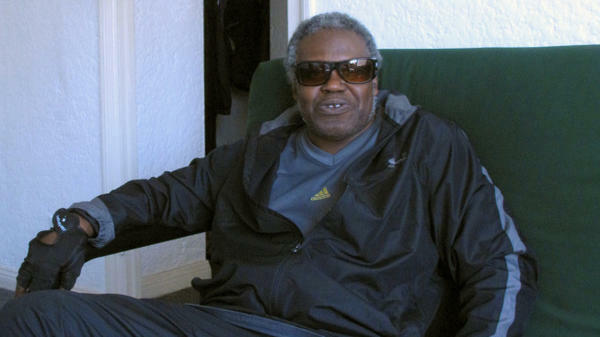 In fact, James Brown told me when I interviewed him for the NPR story last month that he was surprised by the kindness he received as a homeless person in Encino, that it wasn't always easy being out on the streets. "It was just really strange to be in an area where everybody has a brand new car. I mean everyone. Even kids out there seem to. It was just a very opulent area. And here I am hanging out, " said Brown, who described himself as "dirty" and "shirky-looking" at the time. "The people there took me under their wings, surprisingly, and I was able to really get some really, a lot of support," he added. Brown said Bressick initially "read him the riot act "(Bressick admits he told Brown he couldn't hang out in front of his building the first time he saw him there). But Brown said, "After a while, when he saw that I seemed to be just harmless and kept to where I was quite clean, I was able to be there." And it's where he stayed, until he came in contact with some local nonprofits that helped move him into his first home. Brown says it's "amazing" to live inside, and he hopes to stay there for the rest of his life. We spoke to Brown's caseworker, who confirmed Brown had sent the letter. Not only that but he said Brown sent at least four other letters to places that had helped him out over the years when he was homeless.